The third of the Rozen Maiden dolls and the older twin sister of Souseiseki, Suiseiseki has the ability to communicate not only with the living earth but also with the "soul trees" of humans. Described by her younger sister Shinku as the most "timid and shy of sisters", and even as a "crybaby", it is not surprising to find her hiding behind any of her sisters in the presence of strangers. With those she is aquainted with, however, she tends to show a more devious personality and often show favoritism to some of her acquaintances. Her antics in particular include smashing bedroom windows of male lead Jun Sakurada and torturing younger sister Hinaichigo with wild lies. Despite her attitudes, however, Suiseiseki is considered the pacifist of the group, being one of the few dolls who oppose the Alice Game, valuing her sisters more than the purpose of becoming Alice. 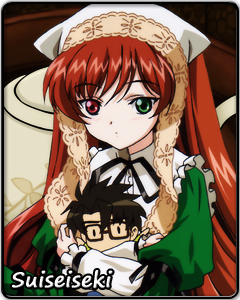 To Shinku, Suiseiseki may be the most timid and shy of sisters. 2006's moe season created a different impression of Suiseiseki. Peaceful? Try explosive. After a 46 point loss to Shinku herself in Japan's Saimoe 2005, Suiseiseki made a huge impression in 2006, going virtually undefeated in both Japan and Korea to sweep both tournaments. Her road to history was not easy. A 420-420 matchup with Shana (Shakugan no Shana) forced Suiseiseki into two Fate/Stay Night matchups with Sakura Matou and Rin Tosaka, both of which resulted in wins of less than 100 points respectively. A win in a rematch with Shana and another easy win over Eri Sawachika (School Rumble) led to the 2006 Korean championship. In Japan, after an easy preliminary round, Suiseiseki had to dodge her older sister Suigintou to make the group finals, i.e. the top 16. After an easy win over Alice Carroll (ARIA), Suiseiseki secured a statement win over heavy favorite (Yuki Nagato) in the highest scoring matchup of Saimoe 2006. A 42 point win over Shana (again) and a 67 point win over Fate Testarossa (Nanoha) secured the victory and a sweep for Suiseiseki. In 2007, Suiseiseki continued to be explosive, but she was denied by those who were equally as strong, and it seems the strong get stronger. An easy schedule in Japan Saimoe 2007 led to a loss to Tsukasa Hiiragi (Lucky Star) in the round of 16, where Suiseiseki's individual votes received record was also eclipsed by Tsukasa. Korea's Best Moe 2007 was more nostalgic - after a close matchup in the round of 32 again, this time an 84 point victory against Ayu Tsukimia (Kanon), Suiseiseki received the luxury (or not) of facing both Fate and Shana back-to-back once again. In the round of eight, A 7-point victory in a Suiseiseki-Fate matchup marked a sign of things to come, and in the semifinals, Shana handed Suiseiseki her hardest loss to date - a margin of 387 votes. In the 2006-07 Korea Super Best Moe, Suiseiseki lost twice to Hayate no Gotoku representatives, first to 2007 Korea Champion Hinagiku Katsura in a 17-vote difference exhibition match, followed by a 73-point loss to Maria in the quaterfinals. With the Rozen Maiden series currently inactive, Suiseiseki is currently ineligible for the yearly tournaments and will have to settle for the 2006-2008 Korea Super Best Moe tournament in November. However, the International Moe League will prove to be Suiseiseki's toughest tournament yet, as all contestants Suiseiseki has faced with less than a 200 point margin, with the exception of Ayu, are also participating in this league. Even so, Suiseiseki is determined to prove she still has the moe power to take the international crown.